Advertising has always been the hard sell and subtle hustle that piques our interest and gets us thinking. The Better Mousetrap gives readers an accessible, provocative and insightful glimpse into the brand and advertising strategies of some of the world’s leading companies. 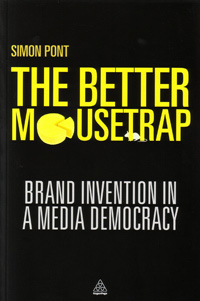 Excerpted from The Better Mousetrap: Brand Invention in a Media Democracy (978-0749466213), by Simon Pont, published December 2012 by Kogan Page. Copyright 2013 by Simon Pont. Reproduced by permission of Kogan Page. Copyright © 2013 Kogan Page Limited. All rights reserved.